We all hope you have a wonderful Thanksgiving holiday. As you enjoy time with family and friends, we hope you reflect on the all the things you are grateful for this year.  We are more than thankful for all of our customers. And just like you, we too will be enjoying time with our families this week. Our offices will be closed Thursday and Friday (November 22 and 23, 2018). 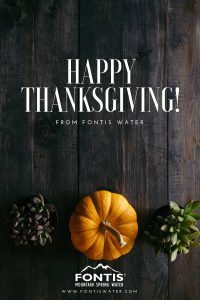 Happy Thanksgiving from all of us at Fontis Water! But before we go, here are some fun facts to impress family and friends. First. did you know our national holiday actually stems from the feast held in the autumn of 1621? It is true, the Plymouth colonists and Wampanoag Indians shared an autumn harvest feast. That feast is acknowledged today as one of the first Thanksgiving celebrations in the colonies. However, for more than two centuries, days of thanksgiving were celebrated by individual colonies and states. In 1863, in the midst of the Civil War, Thanksgiving Day was proclaimed by President Abraham Lincoln. More fun facts to impress your family and friends, because isn’t that what we do at the holidays? 100,000+ is the number of questions experts will typically answer between November and December on Butterball’s Turkey Talk-Line. More importantly, if you need the number here it is 1-800-288-8372. You are welcome! Did you know 244 million turkeys were raised in the United States in 2016. And roughly 44.5 million of them came from Minnesota. Perhaps one of the most staggering numbers is $2.983 billion. This is the amount spent on Thanksgiving dinner in the U.S. Now that is a lot of turkey and dressing, however there are no regrets! Sweet potatoes anyone? 3.1 billion pounds of sweet potatoes were produced by major sweet potato producing states in 2015. Fun places to live and eat turkey? How about Turkey Creek, Arizona; Turkey, Texas; Turkey Creek village, Louisiana; and Turkey, North Carolina. Lastly, turkey was not at the top of the list at the first Thanksgiving. Most likely, the first feast probably had deer or venison, ducks, geese, oysters, lobster, eel, and fish. While these all sound amazing, aren’t we grateful for turkey and dressing? Again, Happy Thanksgiving to you all. May it be a time of joy for all. The above stats compliments of the Census Bureau, USA TODAY and Statistics Brain.